Delicious food in a beautiful environment! I was so happy to find this cafe! It is really special since it's in the middle of a lovely (free) park. During our week-long stay in the area we went there for breakfast, lunch and an afternoon snack. 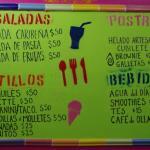 The prices are very reasonable: for example, salads are 50 pesos and ice-cold smoothies are 25 pesos. The kitchen is open 9am-4pm and it is closed on Mondays. 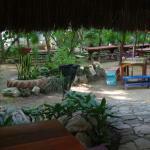 I can speak some Spanish, although there's always a cafe staff person who can speak English, if needed. The menu is similar to their other cafe location (La Ceiba de la 30) although this cafe is in a quiet neighborhood and has plenty of street parking. After entering the park gate, walk on the path to the left about 50 feet and you will find a sign pointing to the Cafeteria. There's lots of tables for sitting in the shade. 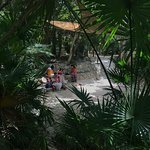 Been to Parque La Ceiba? Share your experiences!